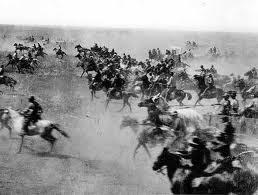 April 22nd is the 125th anniversary of the first Oklahoma land run. It's an exciting piece of the history of my state and the theme of a book I'm currently writing called Gabriel's Atonement. Rome, as we all know, wasn’t built in a day, but the city of Guthrie, Oklahoma, was. Or, to be more accurate, it was “built” in a few hours. 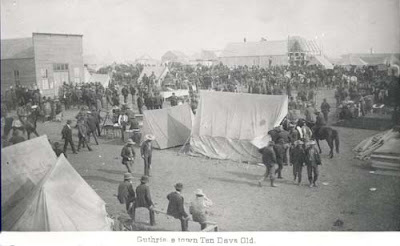 On Monday morning, April 22nd, 1889, Guthrie was an unpopulated stretch of prairie land where coyote, wolf, and deer roamed freely, but before sundown, it was a town of at least ten thousand. The same was true for Oklahoma City. In the few hours after the cavalry bugles were blown indicating the start of the land run, streets had been laid out, town lots staked off, and steps taken toward the formation of a municipal government. That evening, the campfires of ten thousand people flickered on the grassy slopes of the Cimarron Valley. That day, nearly two million acres of land opened up to white settlement the in Unassigned Lands of the Oklahoma Territory. Initially considered unsuitable for white colonization, Oklahoma Territory was thought to be an ideal place to relocate Native Americans who were removed from their traditional lands to make way for white settlement in other states. The relocations began in 1817, and by the 1880s, what is now the state of Oklahoma was home to nearly 40 tribes, including the Creek, Choctaw, Chickasaw, Cherokee, Cheyenne, Comanche, Kiowa, and, Apache. By 1889, much of the free land in America had been snatched up. Americans began pressuring the U.S. government to allow white settlement in the Oklahoma Territory. On March 3, 1889, President Benjamin Harrison announced the government would open the 1.9 million-acre tract of the Unassigned Lands for settlement, precisely at noon on April 22nd. With only seven weeks to prepare, land-hungry Americans quickly began to gather around the borders of the irregular rectangle of land. By the appointed day, more than 50,000 hopefuls, sometimes referred to as Boomers, were living in tent cities on all four sides of the territory. At 11:50 a.m. on April 22nd, 1889, soldiers signaled the Boomers to form a line. When the hands of the clock reached noon, cannons boomed and bugles rang out, and the race began. With the crack of hundreds of whips and yells of a myriad voices, thousands of Boomers streamed into the territory in wagons, on horseback, penny-farthing bicycle, and on foot. By nightfall, thousands of settlers had claimed town lots or the one of the many160-acre quarter sections of land. Towns like Norman, Oklahoma City, Kingfisher, and Guthrie sprang into being almost overnight. By the time Guthrie was only one month old, it had a hotel, general stores, three newspapers—and fifty saloons. The pioneer spirit battled the American lust for land. The first Oklahoma land rush was plagued by greed and fraud. Many of the U.S. Marshal deputies sent in early to stake out the towns, illegally staked their own claims before the race began. Other settlers, called “Sooners," entered the territory before the legal date and time and snatched up prime land. All total, there were five land runs for former Indian lands in Oklahoma. The government attempted to operate subsequent runs with more controls, eventually adopting a lottery system to designate claims. By 1905, white Americans owned most of the land in Indian Territory. Two years later, on November 16, 1907, the area once known as Oklahoma Territory, joined with the Indian Territory and entered the Union as the new state of Oklahoma. Never before in the history of the West has so large a number of people been concentrated in one place in so short a time. 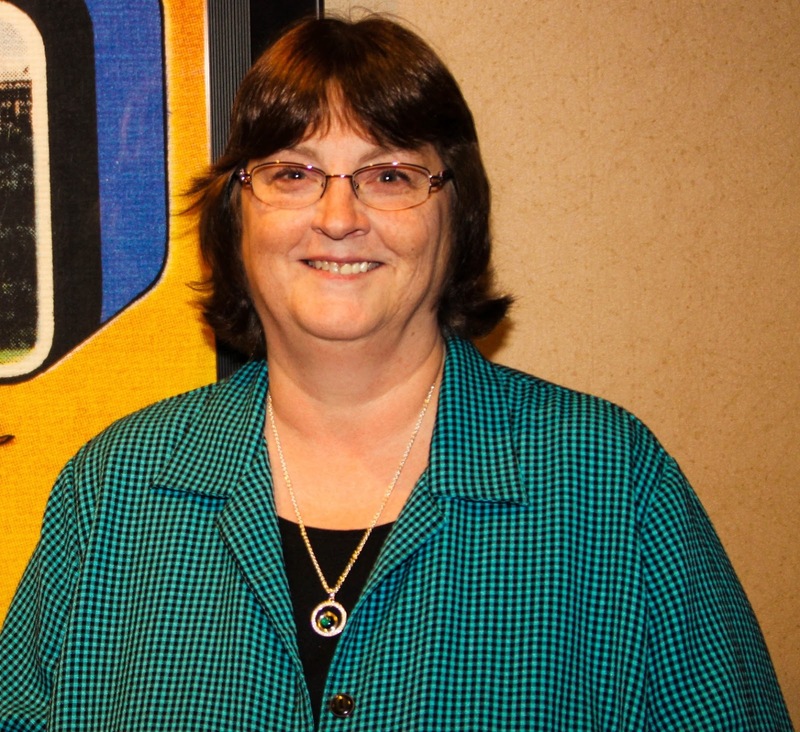 I was born and raised in Oklahoma, and the topic of the land runs has always fascinated me. I love the scene from the movie Far and Away, where Nicole Kidman and Tom Cruise ride in the land run, so it’s probably no surprise that the first book I had published was partially centered around the 1889 land rush. Sooner or Later is still available in eBook format, but next year, you'll be able to my series Land Rush Dreams, starting with Gabriel's Atonement, which releases in January, 2015. Surprise! I'll give one lucky commenter a copy of South Carolina Brides. Visit my website(address below) and sign up for my newsletter for an additional entry. Thanks, Eliza. I love Far and Away too. It's an exciting movie and gives you a good feel of the land rush days. Living in Texas, I am a neighbor. 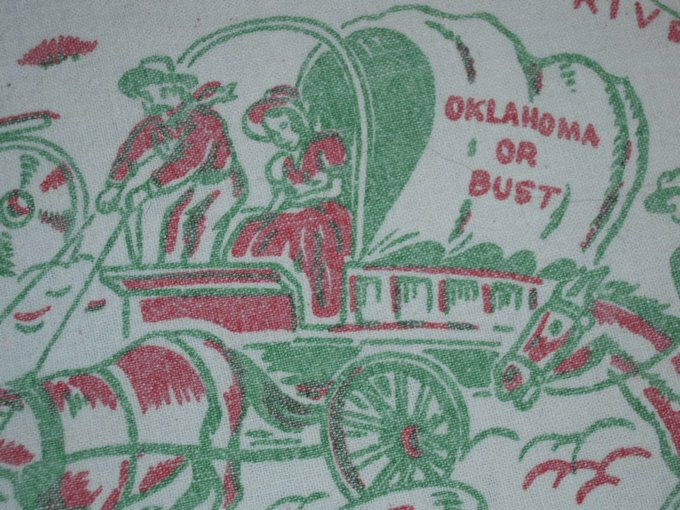 It was driving through Oklahoma on our way to Tulsa that gave me the idea for setting my first series in Oklahoma between the land rush and statehood. We stopped at a tourist information center along the the way and the history of Oklahoma was almost as fascinating as that of Texas. :) CAROLINE"S CHOICE has a chapter or two that depict the inauguration of Oklahoma into Statehood. Fascinating times. The story of Guthrie blew my mind. So many people in such a short period of time...wow. Thanks for the additional info. I love Oklahoma's unique history. Where I live used to be part of the Creek Nation, just over 100 years ago. Hard to believe. 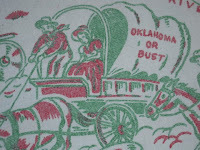 My next series is called Land Rush Dreams and centers around 3 of Oklahoma's five land runs and lotteries. You really should visit Guthrie some time. It's a super cool historical town. If you go, let me know, and I'll meet you there if I can. Will do, Vickie. Our granddaughter now lives in Norman with her family, and we love to drive up there to see our three great-grans. Getting harder on us to make the trip, but next time we do, I'll let you know. The land rush is such a fascinating period. Like Martha, I, too, live in Texas, right on the OK line, so its always fun to hear things about my neighboring state. Please enter me in the giveaway. I am a Texan, but my daddy was born and grew up in Marlow, OK. I would love to win a copy of your book. Susan, My grandpa on Mom's side of the family was a Texan. :) So we have lots in common. Signed up for your newsletter. mamaw1050 (at) att (dot) net. I am a Native Texan and now live in the Deep Southeast Texas Piney Woods and love my piney woods. I love western historical fiction. Enjoy your books very much. I love that scene in Far and Away as well. Her parents were Sooners too- staking out their claim early :) I love reading your books and am looking forward to your new one! Thanks for the giveaway! I'm subscribed to your newsletter as well! Thanks, Heidi. Take was so unexpected for Shannon's parents to be Sooners--an interesting twist, for sure. Vickie, What a fascinating post ! I had no idea a town could form so quickly!! That was an amazing feat to accomplish. Thank you. Also love your books I always look for them in the library and bookstores. Jackie, I imagine it would have been a fascinating thing to see--a town rising up in one. Thanks for being a subscriber! Vickie, I love the land run history, too! Guthrie is one of my favorite towns in Oklahoma and I just get soaked up in all that unique history and the amazing characters who would do such a thing! Great post. Me too, Linda. I love visiting Guthrie. We lived for four years in western Kansas - just 2 miles from the OK panhandle. I always wondered why anybody was in a hurry to get there. ;) But not I see that the panhandle wasn't part of the whole land rush deal. Pegg, I've been to the panhandle too. Not a whole lot there, huh? 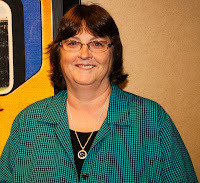 Vickie - as a native Oklahoman I should know more about the history than I do. I found your post fascinating. I love visiting Guthrie, next time I go I'll see it through new eyes. One thing I found amazing - 50 saloons! Terri, If I'm remembering right, Guthrie has more buildings on the historic registry than any other town west of the Mississippi. Pretty amazing! I love that part of Far and Away and I was picturing those scenes in my head as I read your blog post. kosterbind (at) gmail (dot) com. I am also signed up for your newsletter. :) I love the land run scenes in Far and Away. Hi Vickie! I remember the three I lived in Norman while I was still in elementary, every year our whole school would do mock land run on the playground. Unfortunately, I'm not athletic so I was never able to procure my own piece of land so I never really enjoyed doing it. Ive always known what a Sooner was, but not a! Boomer! Thanks for the chance to win SC Brides! I can't wait for your new series, it sounds good! Kam, The mock land run sounds fun, but I can see how it wouldn't be as fun if you never won. Think how hard it must have been for the pioneers who didn't win land. For many, it was their only hope to get land of their own. Oops again! I've gotten your newsletter over a year now! 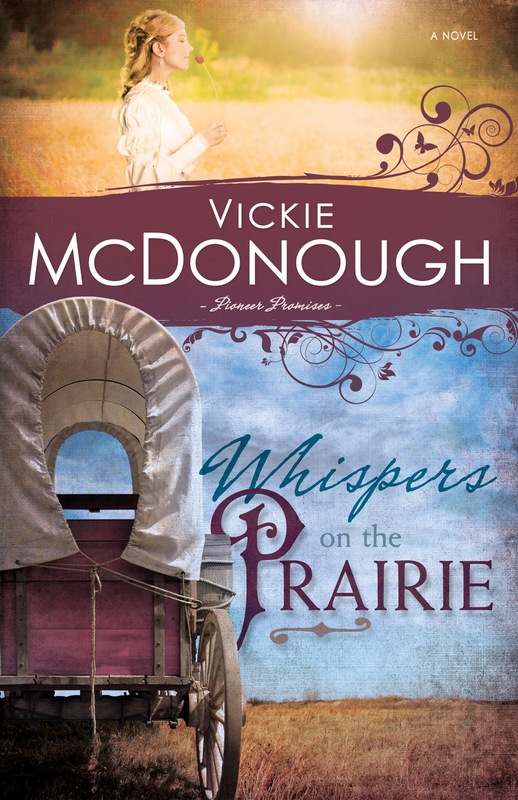 Is your Whispers on the Prairie series only going to have the two books that are out in it? Kam, Song of the Prairie is the third book in my Pioneer Promises series. It's Aaron's book, and it releases in mid-August. It's probably the most exciting of the three books. Interesting post, Vickie. 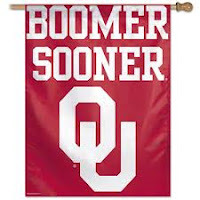 I know now what a Boomer and a Sooner is. Who knew! The land grabs sound like mayhem. I think the land run is very interesting. Oklahoma has some unusual history. Thanks for sharing, Vickie.